Apple has a tendency of playing catch-up to rivals and then beating them. Apple (AAPL - Get Report) is late to the smart speaker market -- but it can still win. Apple's $400 Siri-powred HomePod smart speaker is set to ship in December, three years after Amazon (AMZN - Get Report) introduced the $179.99 Alexa-powered Echo and a year-and-a-half after the $129.99 Google Assistant-powered Google Home was released from Google, owned by Alphabet (GOOGL - Get Report) . Alexa-enabled devices command over 70% of the smart speaker market -- for now. Loup Ventures founder Gene Munster thinks Apple is set up to leap over Amazon as the market leader, according to a note he released on Friday. Apple can make up for the three years it sat out of the smart speaker sector because the long-term winner in the space will be the speaker that "provides its user with a heightened experience and improved efficiency," he wrote. " We believe Apple is uniquely positioned to do so, as Apple's device ecosystem delivers a frictionless experience, which will only get better with the adoption of voice-first computing." Amazon may have a head start in the smart speaker market, but it's playing at a disadvantage without an existing base of smartphone users that can integrate the technology, he noted. On the other hand, Google, which claims a 24% chunk of the market, doesn't have the "exposure" that Alexa Skills or SiriKit has, he noted. SiriKit is important for the success of the HomePod because it allows third-party developers to integrate iOS apps and watchOS apps with Siri. Soon, users will be able to ask Siri to carry out more complicated tasks than simply reporting the weather or setting a timer, Munster noted. While Siri has not managed to impress users overall, "the Siri we have come to know on our iPhones and the upcoming Siri that lives in HomePod with third-party integrations are two very different animals," he wrote. Siri is setting the HomePod up to take the smart speaker market by storm because its strength is being able to handle questions that are more complex, Munster said. The voice assistant can understand multi-step commands, such as "make a note called Slide 4 in my Presentation Notes folder that says: change transition," Munster pointed out. "These functionalities are not unique to Siri, but Apple's seamlessly integrated ecosystem of devices puts them in a position to employ voice-first computing in ways their competitors can't match," he explained. With a price tag that's significantly more than its two biggest competitors, the HomePod will need to impress customers. At Apple's annual developer's conference in June, the company introduced the HomePod as a smart speaker that would be particularly good for listening to music due to its high-quality speakers. However, Munster thinks that was just Apple's way of setting its speaker apart from the Echo and Google Home devices since it needs to take market share from them to succeed. "Apple didn't want a 'me too' product," he said. "But at the end of the day, it's the same thing." But even though the HomePod is $170 more than its nearest-in-price competitor, Apple fans are eager to get their hands on it. 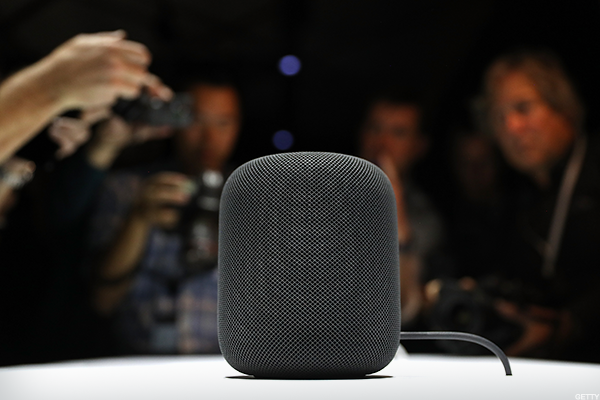 A Raymond James survey of 500 consumers in June showed that about 14% of iPhone owners intend to buy the HomePod, which is more than the 6% of respondents that indicated they wanted to buy an Apple Watch in a similar survey the firm conducted ahead of the wearable's release in the spring of 2015. According to the same survey, 16% of respondents plan to buy an Echo, while just 2% plan to buy a Google Home.